One record: 4 on the Gulf of Kalloni off Mesa 1 Jan 09 (T Robinson). This is only the fourth record for the island. One record: 1 Polichnitos Saltpans on 28 Jul (T Robinson). This is only the eighth record for the island. One record: 11-24 September, 1 off Skala Kallonis (photo: R Lawrence et al). This is only the third post-2000 record. One record: 2 May, a sub-adult north along the Tsiknias River Valley (I & S Bambrough, S P Dudley). This is only the sixth record for the island. One record: 2 May, a sub-adult at the Vouvaris River mouth (T Robinson). This is only the 10th record for the island. Two records: 1 Potamia Valley 8 Apr (photo: M.A. 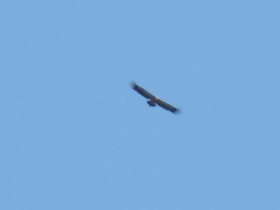 Neumann); 26-28 April, first seen over Eresos on the 26th (Limosa group) and then the following two days (27th-28th) around the old dead goat pit at Madaros north of Kalloni (P & V Manning, D & B Bradnum et al). This is only the 11th record for the island. 8 May, two birds north over Agios Ioannis (photo: P Solley et al). These are the 9th to 11th records for the island. One record: 7 May, 1 Haramida Marsh (S P Dudley). One record: 12 September, an immature at Polichitos Saltpans (R Lawrence et al). The sixth record for the island. A second individual seen at Tsiknias River in September was rejected by the Committee as identification unproven. Two records: 9 Apr, 1 with House Sparrows Skala Sikaminias (M.A. Neumann); 3 May, 1 with House Sparrows (Σπιτοσπουργίτης) Passer domesticus at the Petrified Forest Visitor Centre (R Harding). The sixth record for the island. Two reports: singles Polichnitos Saltpans 25 Apr and Tsiknias River 28 Apr. One report: 1 Polichnitos Saltpans in May. Two reports: singes Christou (Kamares) River 27 May and 18 September. One report: 1 Metochi Lake 30 April – 6 May. Despite apparently having been seen by a number of observers details have not been submitted to LBRC. Two reports: singles Faneromeni 21 April and Meladia Valley 7 May. One report: 3 Meladia Valley in 25 April.